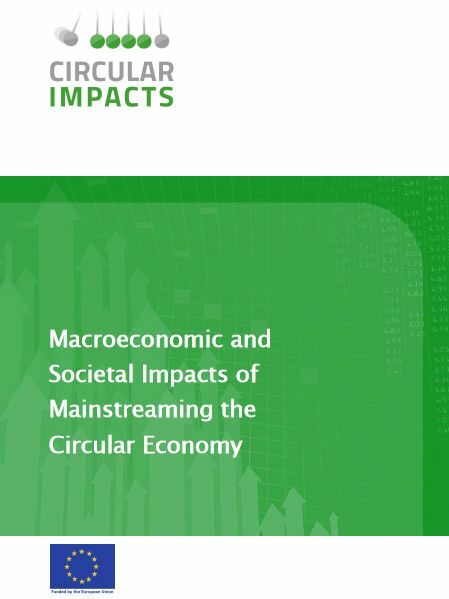 This report summarizes the key findings of the CIRCULAR IMPACTS project and provides an impact analysis setting out impacts of circular-economy transitions on the macroeconomy and society. The results of case studies conducted within the project are included as are results from modelling done by external parties, accompanied by an overview of the methodologies used. This report thus provides an overview of presently available quantitative evidence on the macroeconomic and societal impacts of the circular economy. In addition, an overview of recent policy development on EU level in relation to the circular economy is provided, as are the key conclusions and policy messages from the project. Lastly, recommendations for future circular economy research are given, with the aim of improving scenario-based impact analyses for the European policymaking context. Best, Aaron et. al. 2018: Macroeconomic and Societal Impacts of Mainstreaming the Circular Economy. Ecologic Institute: Berlin.